But why should we be satisfied with (1)? In Part II, we'll motivate the equation via information theory. In this Part I, we'll resort to one of my favorite topics from physics: effective field theory. Note that higher order derivatives by themselves are not consistent with homogeneity. If we take D→α D, S→α S means that d²D/dS² → (1/α) d²D/dS². Terms like D d²D/dS² would be necessary, which we'll subsume into "generalized" second order terms. where all terms we consider must be consistent with Lorentz symmetry (i.e. special relativity, this theory is also symmetric under charge symmetry as well); the resulting theory is guaranteed to be consistent with Lorentz invariance. This way of coming up with particle theories is called an effective field theory. Generally, one writes down every possible term consistent the symmetries under consideration. Our process with equation (3) was analogous to writing down every consistent with long run neutrality of money (analogous to a symmetry). 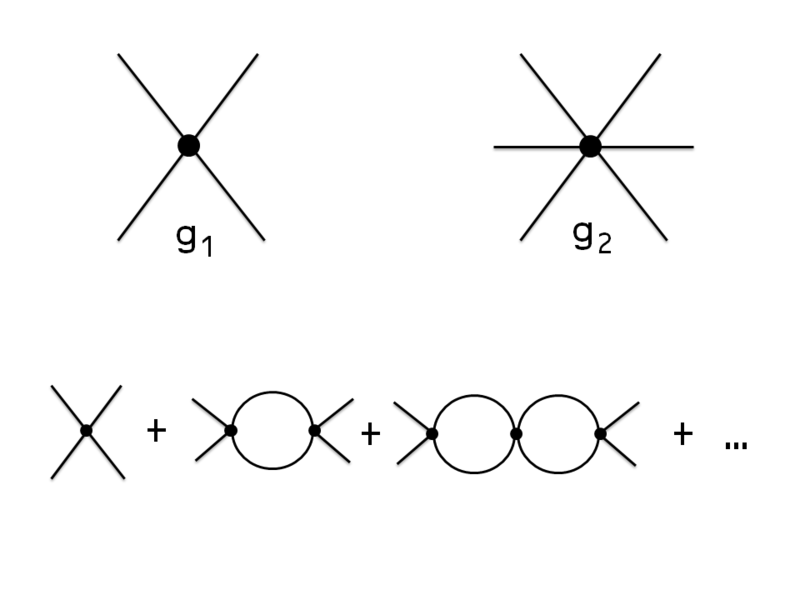 The higher order terms in field theory (4) represent higher order interactions (2, 4-particle, etc interactions with coupling constants $g_1$, $g_2$). They tend to be "suppressed" (in physics) because the coefficient has dimensions of mass and that mass is considered "heavy". The higher terms (degree > 2) in the Lagrangian represent vertices (interactions) in Feynman diagrams. It is possible that the analogous terms in our long run neutrality of money (money invariance) theory (3) represent three or more party transactions which would be heavily suppressed by the existence of money (you'd likely trade apples for money and then get oranges with some of that money rather than work out some complicated contract between the three parties allocating money, oranges and apples). I.e. 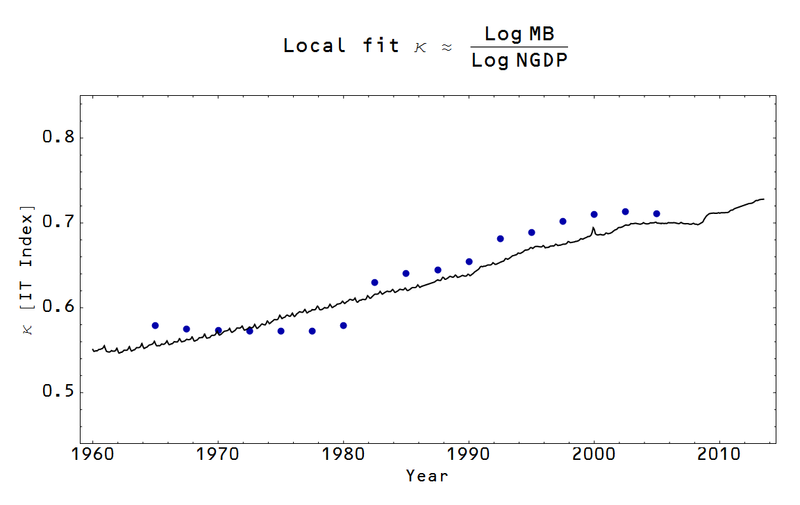 the higher order coefficients $c_2$, $c_3$, ... might be suppressed by factors of 1/MB (!) 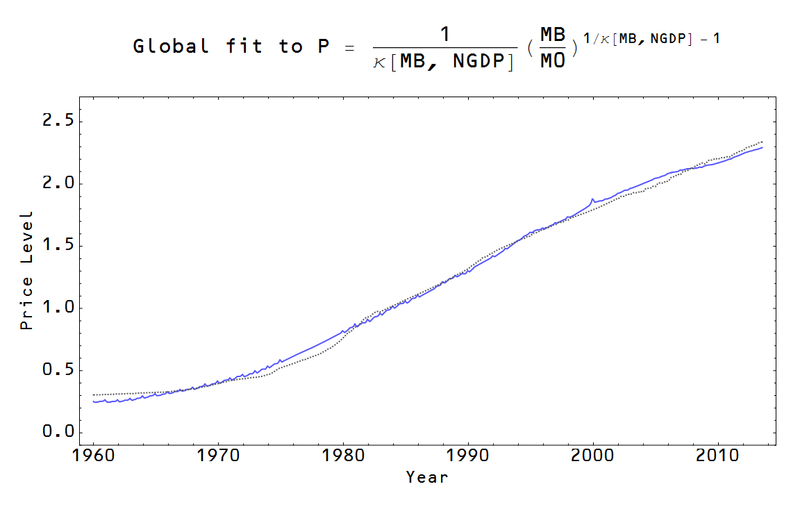 where MB is the size of the monetary base (how much money is out there). In Part II, we'll motivate (1) with information theory. This prescription of κ = log S/log D is reminiscent of the beta function in quantum field theory; it is motivated by empirical evidence and the information theory in Part II because κ is the ratio of the number of symbols used to describe S to the number of symbols used to describe D. In an older post, I refer to it as the unit of account effect when used to describe the price level: the size of the money supply defines the unit of money in which aggregate demand is measured. Series expansions around α ~ 0 have a small coefficient for the linear term (if S, D >> 1) and the limit as S, D → ∞ is independent of α. We'll take c0 to be zero, too. Although we shoud be careful. Einstein famously took the equivalent of c0 (the cosmological constant) in general relativity to be non-zero in order to allow a steady-state universe. He later regretted that action, but more recent results show that it is not actually zero, but very very close. I did an update to convert the equations to mathjax ... hopefully that didn't mess too much up. 1) "A Taylor expansion of g around D=S results in an equation of the form..."
Where g' = dg/du and g'' = d(dg/du)/du, etc. 2) Why about D=S (equivalently u=1)? 3) Also, what do you mean by MB here? Base money or base money minus reserves (currency)? (i.e. which did you use to make the plots of your model results with? It looks pretty good, so I'd assume you meant currency). 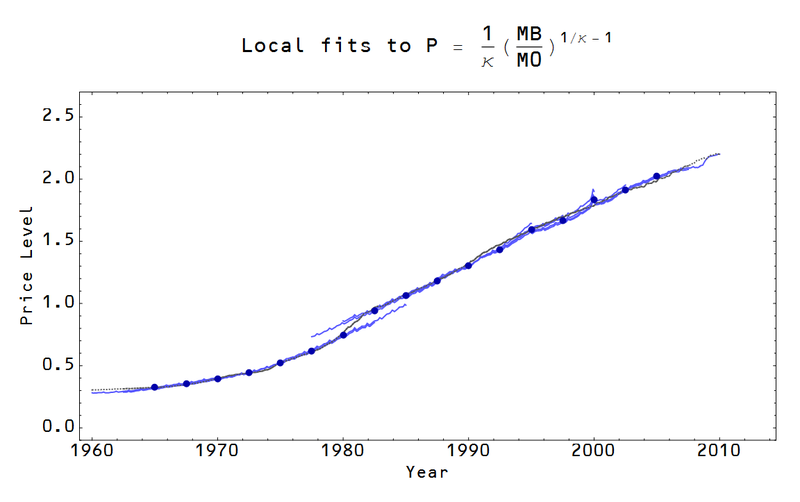 4) You use M0 in the title to a plot above, but I assume that you don't mean currency by that, but instead a normalization parameter? 5) I read this before (I think), but it's a fairly mind blowing post. I'd forgotten about it I guess. Basically it's an alternative derivation (alternative to the information theory approach) of the price level formula based on long run neutrality of money, and the kinds of differential equations that implies. 6) "κ (which I'll just call the IT index for now)"
7) I had all kinds of questions about the plots, but I'm pretty sure I resolved them all by staring at them long enough... my 1st attempt to comment (w/ those questions) was lost by me pressing the wrong key... it may have benefited other readers. 8) "Our process with equation (3) was analogous to writing down every consistent with long run neutrality of money (analogous to a symmetry)." I think you forgot the word "term." 1. I'm not sure what your point is here. If it is that the form doesn't look exactly the same -- you can expand all the terms (u-1)^n and collect powers of u. In reality it's not a Taylor expansion and you need terms like (D/S) dD/dS ... but I mention those as generalized 2nd order terms immediately after. 2. That is expanding around the equilibrium where demand = supply. 5. Yes, it's an alternative approach based on "effective field theory". 6. I call both "kappa" and k the IT index, but I now try to be consistent in using k for a general index that is in the numerator on the RHS of the information transfer equation. "In reality it's not a Taylor expansion and you need terms like (D/S) dD/dS ... but I mention those as generalized 2nd order terms immediately after." "Note that higher order derivatives by themselves are not consistent with homogeneity. If we take D→α D, S→α S means that d²D/dS² → (1/α) d²D/dS². Terms like D d²D/dS² would be necessary, which we'll subsume into "generalized" second order terms." As I said, it's not really a Taylor expansion. A Taylor expansion around D = S is just a conceptual jumping-off point for people not familiar with effective field theory. It's an effective field theory expansion (the Lagrangian that goes with a Feynman diagram expansion) -- you write down all the terms consistent with the symmetry principle (invariant under D→αD, S→αS). But neither the coefficients nor the terms are necessarily "small" ... unless you have good physical reasons for it. Ah! Ok. That's what you meant by "it's not really a Taylor expansion" ... I thought perhaps that was a comment on my attempt with substituting u=D/S. 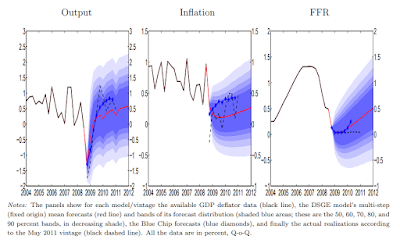 Did the Fed offset the ARRA?